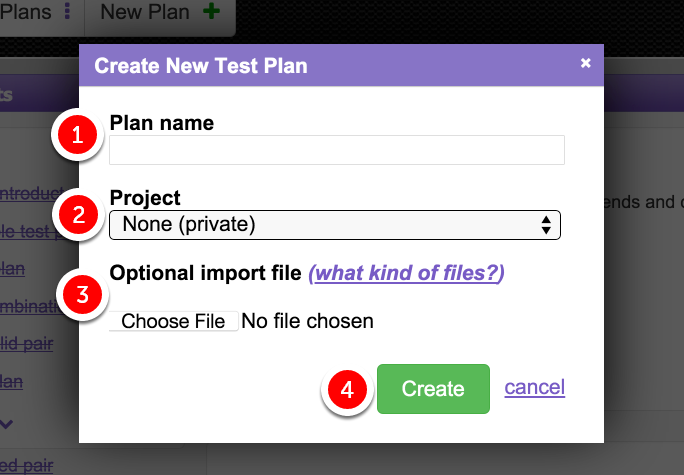 This lesson explains how to quickly create a new test plan in Hexawise. 1) Add a plan name. Use the default "None (private)." 3) Optionally, (if you already have a set of test inputs created in Excel or a mind map), select "Choose File" to import the file. 4) Click the "Create" button. 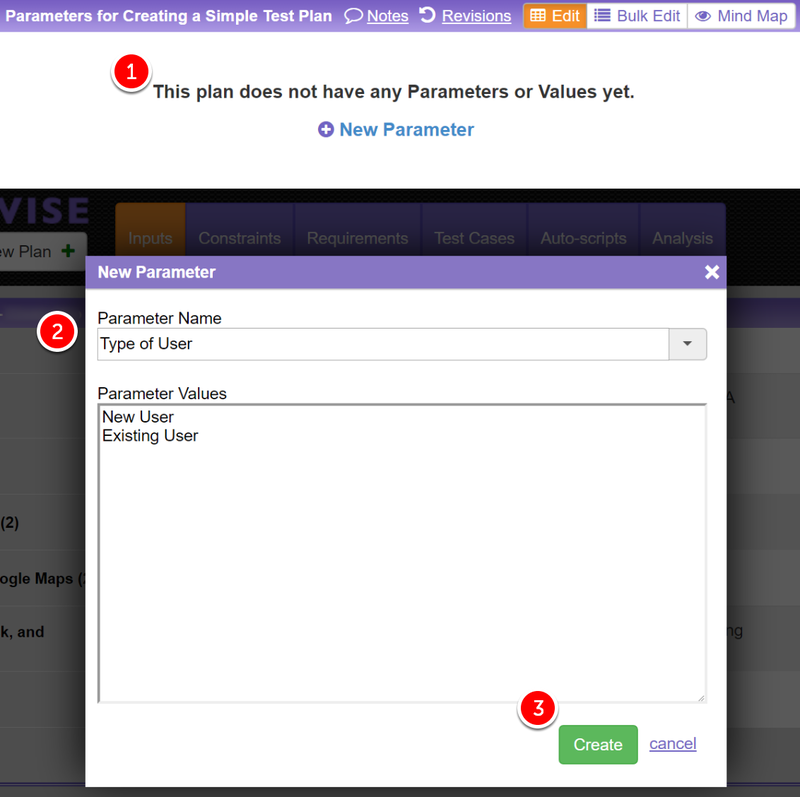 All Hexawise test plans have Parameters and Values which are entered on the "Inputs" screen for the plan. To enter these, follow these steps. 2) Type or Select a Parameter Name. a) Parameter Values may be edited on this screen, as well. 4) "Rinse and repeat" until you are ready to click on the "Test Cases" button. View some sample plans to get ideas about typical kinds of inputs that go into Hexawise. "Start with a Verb and Noun" and ask "reporter questions" (who, what, when, where, why, how how many). Check out the How can I best identify variation in the system I'm testing? Hexawise help file. If the system works exactly the same whether someone's name is Jim Green or Susan Smith, you may well want to leave "First Name" and "Last Name" out of your Hexawise inputs. If the gender of users would impact how the system works, you would probably want to include "Gender" as a Parameter (with male and female as the accompanying Values). The default coverage strength for generated test cases is 2-way ("pairwise," or "all pairs"). For more information, please see the related Hexawise lesson on "what is pairwise testing?" You can also select different coverage strengths (3-way combinatorial testing coverage, 4-way, 5-way, and 6-way). 2) Hexawise generates the smallest possible number of tests* to meet your coverage objectives. *We used the word "tests" fairly loosely here. They are actually sets of optimized test conditions at this point. The first set of test conditions should be executed in your first test script, and so on. You can use the other features of Hexawise (including Expected Results, Requirements, and Auto-scripting) to transform these "bare bones" test scenarios into comprehensive, fully-stepped-out test scripts with detailed tester instructions, Expected Results, and requirements traceability notes. These detailed test scripts can even be automatically formatted for importing into customized versions of HP QC / HP ALM that your company uses.